At once hopeful and harrowing, Mimi and Dona looks at situations common in many families, situations concerning aging parents and children who need them. "Sophie, you eat one." Mimi, 92 years old, is already in motion out of frame as she gestures toward the table. From off screen, filmmaker Sophie Sartain tells her grandmother, "All right." Over her shoulder, Mimi adds, "They're good," as Sartain's camera pitches down toward the plate before her to pause on a honeybun, sealed in a familiar crispy plastic. Sartain doesn't need to say anything else in this moment near the beginning of hr documentary, Mimi and Dona. With seemingly simple visuals and the brief exchange across shots, you understand Mimi as a woman with a comforting routine and sense of certainty, her long life a testament to her resilience, ingenuity, and commitment. By now, you also know that Mimi is facing a change in her routine, as she's finding it increasingly difficult to care for Dona, her 64-year-old daughter, diagnosed as being on the autism spectrum. As much as Mimi resists this change, she and her other children, including Sartain's mother Merrily, grapple with their responsibilities to one another and also to their own children. 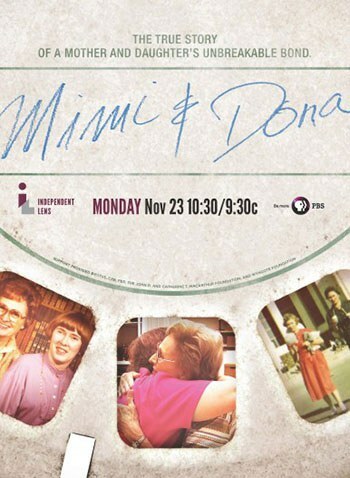 Premiering on Independent Lens on 23 November, Mimi and Dona looks at situations common in many families, situations that are never easily resolved. Introduced as she's singing "You Are My Sunshine" to herself, Mimi Thornton walks with a cane, wholly bent over, active and alert even as her body gives way to age. She attends to Dona gently and also deftly, fixing Dona's hair with the help of a helmet hair dryer and a generous dose of hairspray. They lean across a close living room space, sharing verbal cues and physical rhythms whose details might elude you but make clear their profound, mutually devoted relationship. "This is a story you hope never ends," observes Sartain early in the film, "Mimi and Dona's life together frozen in time." As soon as she says it, you know where the story is going. As the film traces the difficult steps toward that end, both Mimi and Dona embody loss and fear, sometimes in what they say, but more often in how they appear in frame. Sartain's camera is at once observant and unobtrusive, a complicated balance of methods that allows you to understand the trauma of the transition as such. For Mimi, the film suggests, this difficulty is both like and unlike other episodes in her life. Under a selection of black and white family photos -- the sort where individuals look into the lens with their faces set in frowns -- you see that she was born in East Texas in 1906, that her own mother died when she was just 11, and that she was her high school valedictorian and worked her way through college, then married her husband Ozzie and had two daughters. This quick summary, accompanied by an upbeat country song that might characterize both Mimi's interests and attitudes, provides a frame for the documentary's complex themes and stories. Now that the time has come to find a "home", which at best can never be home and at worst, can be frightening and debilitating, Mimi is reluctant to articulate her fears, though her face reveals them each time she's in frame. The film makes clear in her experience how harrowing it is for anyone to find a facility (waiting lists for private homes range from two to five years, and, as Sartain's brother Bo puts it, "We don't have five years, we might not even have five months"), not to mention dealing with any facility's inevitable shortcomings. Even beyond these practical concerns, the film shows another heart-wrenching aspect of Mimi and Dina's story, which is to that it is an increasingly common story. As Sartain looks back on her family's history, she finds that previous generations also had to sort through options for caring for children with intellectual disabilities, some diagnosed as being part of autism spectrum. Moreover, as she observes Mimi's decision-making, Sartain notes that her brother Keith has an autistic son ("I think I have to pretty much live forever and outlive him," Keith says, underlining the impossibility of a wholly good solution) and that her own young child, Ben, is undergoing tests. None of these experiences is quite the same, of course, but Mimi and Dona suggests that each family or individual going through such lurching adjustments in expectations and plans might learn from others. The experience appears to be isolating by definition, as those living through it might feel guilt, regret, and loss. While Sartain makes clear that her own son has opportunities and therapies that Dona could never have had, she also looks back on Mimi's endurance and optimism, her capacity to see Dona "through a lens of dove, deep, constant, eternal", as an inspiration for her own family's future.